The year was 2000. A new millennium with immense possibilities and promises was upon us. There was palpable excitement in the air. And, it was evident at a bridal fashion show being held in South Mumbai. In the clutter of glitter and tinsel, designer after designer had presented over-dressed desi brides, complete with ornately embroidered lehengas, fussy dupattas and enough jewellery to weigh down a Christmas tree. My eyes glazed over after a point—there was nothing new or original on the ramp that night. Till, an unknown designer’s name was announced. I idly looked up as this person’s bride walked out. And, boom! I was fully awake, and impressed. Why? Because I had never seen any bride dressed like a librarian! The bride wore nerdy chashmas and was carrying a pile of books in her arms. Her make-up was messy; her hair in braids and her feet shod in sensible walking shoes! Where did this incredible bride come from? She had popped out of Sabyasachi Mukherjee’s cerebral head! He was a fresh National Institute of Fashion Technology graduate, taking baby steps into the big, bad world of fashion. And, he was doing it his way! I loved his iconoclastic vision—it was Sonagachi meeting the Sorbonne. Sabya has steadily created an impressive fashion empire, starting modestly with a single store and growing into India’s most successful fashion brand. 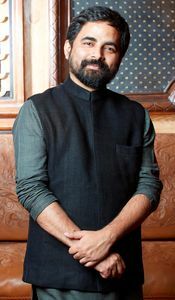 Celebrating two decades of Sabyasachi recently was a must-do event for all those connected to fashion in India and overseas, some of whom had flown in especially for the event. Sabya collaborated with his friend Christian Louboutin to showcase a breakthrough collection of leisure wear that had admirers gasping. I gasped, too. I had moved away from the typical ‘Sabya’ look for a while, and had not fallen in love with any collection in the same way I had in 2000. His ginormous success with fashionistas in Bollywood—he designed for Anushka-Virat’s and Deepika-Ranveer’s weddings—had led to an entire ‘fake Sabya’ industry, selling cheap knockoffs. Driving home from the latest show with my daughter and son-in-law (diehard Sabya fans), I marvelled at the designer’s success story and astute money sense. Sabya has redefined the business model of pricy designer wear in India, by scaling it up sensibly and charging an arm and a leg for bridal wear. For a certain segment of our society, being described as a ‘Sabya bride’ remains the single most coveted compliment! So, how did Sabya do it? He is unafraid to buck the system. Period. Combine that with originality, and you get a brand that has the potential of going global. Sabya works like a beast, putting in crazy hours and supervising the smallest aspects of the business. He is fortunate to have terrific family support, with most family members involved with the label. His ambition dictates his craft. He says he is looking at the next quantum leap that will propel his company to a Rs 2,000 crore turnover! He will be launching a fragrance soon. And, his magnificent jewellery is already being showcased on India’s richest and most influential buyers. Being Sabya is definitely not as effortless as it looks. I recall meeting him at Deepika Padukone’s mental health initiative a couple of years ago, where he spoke feelingly about his own struggle with depression. We all have our demons. Sabya is bravely battling his. I always enjoy our brief encounters—I guess it has a lot to do with our shared Bong connections. Watching Sabya take a bow with Louboutin at the grand finale, I recalled his first ramp appearance that had left several fashion watchers bewildered. Today, they are among his most ardent admirers. I await the opening of his grander than grand mega store in Mumbai, which one hears will recreate the majesty of Kolkata in all its vintage glory. What if Mamata Banerjee, dressed by Sabya, inaugurates it? That will be the day!